I have to say, I’ve been working in the studio for two solid weeks now, 6 days a week and i’m thoroughly sick of it! every day i dream of something new, today being carrot cake with lovely gooey icing, yesterday, all i wanted was a glass of wine and fresh oranges, the day before, a lentil stew with pappadams!! so, i have a lot of work made but to be honest, i’m over it. Jugs are boring, Bowls are soo boring…………………………………………………………………………and yes, i am whinging. 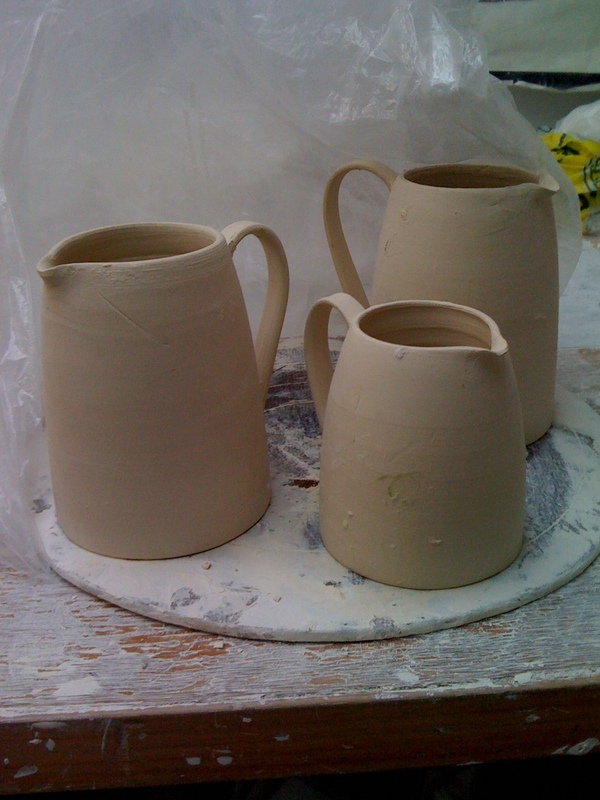 But it is hard to be an artist in this particular phase of the cycle of my pots. i do find it incredibly isolating because all i can think about is shapes and not alot of people think seriously about the line of a form, its not something you chat over coffee about. Also the isolating bit is that anyone can see that i’m making but you can’t see the images i have in my head about what those shapes will be in the end, with the colour and drawings and the text all over the surface of them. To you, they look plain, and white and empty. To me, they are full of colour and narratives. So yes, this part of the process is done alone and patience is something that, after a while is hard to remember you have. Oh, one other whinge is, because its winter, the clay is awfully cold!!! !